Right next to the Quarter, is the thriving Faubourg Marigny neighborhood, a live-music destination with a pocket subculture unto itself. Over the past decade, the Marigny has emerged as one of the vital centers of the city. The Marigny hosts some of the best bars and nightspots in New Orleans, along Frenchmen Street, the neighborhood's main drag. Just downriver is the Bywater, a birthing ground for some of the most inventive new restaurants in New Orleans. We loved staying at this property. It was close enough to the French Quarter thaf we could walk anywhere we wanted to but far enough away that we could escape the madness of Mardi Gras. There was a supermarket 3 mins walk away so we were able to be self contained and have a balance of eating in or out. The property is extremely well kitted out. Everything we needed was there and easg to find. AnnMarie was readily available to answer questions via emails and we never had to wait long for a response. We totally enjoyed our stay in New Orleans and having a place that was comfortable and safe to stay in certainly added to the positiveness of the experience. I would have absolutely no hesitation in recommending this property to anyone wanting a clean, comfortable and enjoyable home away from home. Location and house were great. We are so happy to hear that Alex loved the house and our location. We are sorry that he had difficulty connecting to the network. If he had let us know that he wasn't able to connect, we would have gladly walked him through it. We had guests both before and after Alex with no connection issues so we're not sure exactly what was happening, but we double-checked and everything is operating normally. Marigny is the place to be! This rental is as advertised, clean spacious and well appointed. In a quiet area yet within 15min walk to most destination spots in any direction. I walked 8min to delicious St. Roch market and food coop located in the Healing Center. Studio Be is just a 14min walk. The hosts were very welcoming and accommodating. We were offered some local produce, milk and artisanal bread. Was very impressed with the overhead rain shower ( I’m a total shower snob and adult enough to admit it!). Thank you again for the late checkout! Would certainly stay here again and will happily mention this rental to my friends who also share a love for Nola and it’s wonders. First off this property is GREAT! Charming exterior and neighborhood and chic interior. We were a bit nervous about how far this place appeared from the French Quarter on the map, but it was in a great location. Literally a 5 to 7 minute walk to Frenchman Street or 10 minutes to Bourbon St. This allowed us to get some walking in, see the beautiful houses on Esplanade and enjoy the livlieness of Bourbon for as long as we wanted. When we were ready for piece and quiet it was still within walking distance away! The owners were incredibly responsive and made booking and checking in a breeze. The place is well-appointed, with thoughtful gestures like cold water in the fridge, fresh milk, plenty of towels, etc. 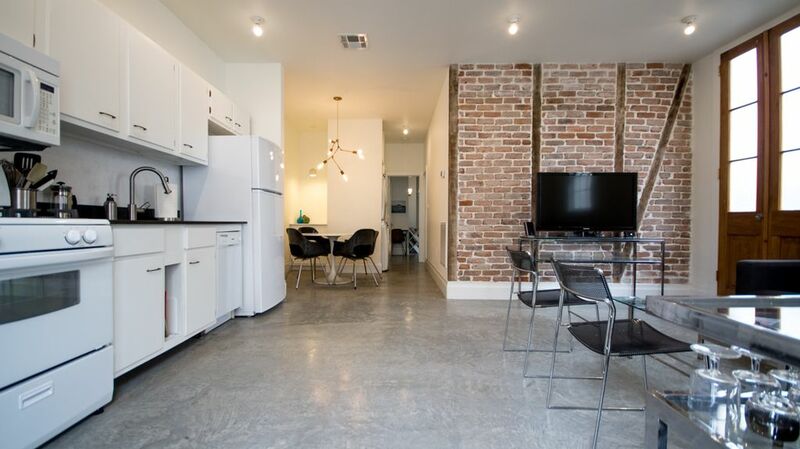 The location is perfect for anyone who wants to explore New Orleans' best neighborhoods. Another VERY important feature: proper air conditioning! It gets HOT here...nothing better than walking into a cool bedroom. Would definitely recommend staying here and would book again without any hesitation. The $300 security deposit is fully refundable shall be refunded within 24 hours of Checkout provided no deductions are made due to: i. damage to the property or furnishings; ii. dirt or other mess requiring excessive cleaning; or iii. any other cost incurred by Homeowner due to Guest’s stay.